Many people said goodbye to physical exercise when they left school. Others may have continued with sport into their twenties but after that the majority become so embroiled in the world of work and bringing up children that even if the body was willing, and even the spirit positive, finding the time meant good intentions never translated into positive action. So imagine that your body has not had any real physical demands made on it for a number of years. Then, suddenly, you’re pulling on the running shoes and expecting it to propel you over distances you haven’t even walked in a very long time. Overambitious would be a polite term for such behaviour. Ill-advised another apt description. Downright dangerous a more accurate one in some cases. But assuming that you have heeded the advice included in the section on the need for a medical check-up and the Doc has given you the thumbs-up - that still doesn’t mean it’s a case of all systems go. Rather it’s time to ease your body back into the world of physical activity, and that means getting tuition on stretching exercises and learning to put one foot in front of the other again. Any form of cardiovascular exercise is going to be beneficial to your heart and lungs, so don’t assume that you need to be clocking up four-minute miles in garish coloured Lycra shorts to be gaining benefits. That will come in time, so for now be patient, pull on the shoes and simply enjoy a 20-minute walk around your neighbourhood. If the gym is where you have chosen to get fit, ask one of the instructors to draw up a walking schedule on the treadmill. Just as in running, aim to progressively up the pace and perhaps, when you are ready; incorporate a few hills into the course, either outside or on the machine. As your walking progresses, you will begin to feel the benefits, to the extent that when you feel totally comfortable with both the increased pace and the steeper gradients, it is time to introduce running into the equation. But again, take things one step at a time. Divide your walk into four sections, using physical landmarks to mark them out. Walk the first section, then break into a gentle jog for the second, walk the third and again jog the home straight. 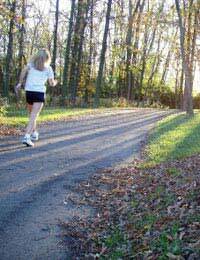 When you feel more confident, split your time 50:50 so that the first half involves walking, the second running. Similarly, start by tackling the steeper gradients along the way by walking, then think about including them in the running sections. As confidence grows, you will inevitably want to extend the length of your course but always remember that you are in this for the long-term: only set yourself a challenge that you are confident you have the ability to meet. Because it is confidence that will not only ensure that you keep up the good work but encourage you to take your new-found fitness to the next level.